Winston-Salem is a city located in the U.S. state of North Carolina. It is the fourth largest city in the territory of North Carolina. Winston Salem has a population of 229, 617 people. 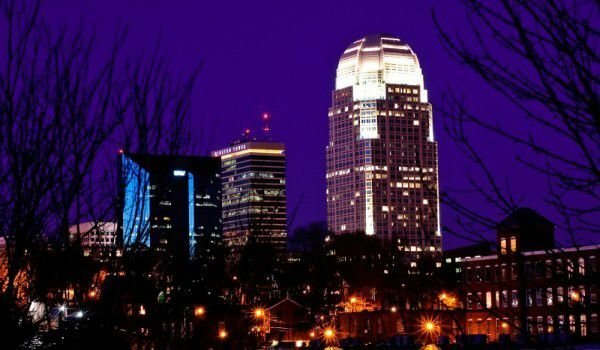 Winston Salem is known with the nicknames Twin City and the City of Arts. The history of Salem began at the start of 1753. At that time, Bishop August Gottlieb Spangenberg of the Moravian Church had chosen for the settlement an area, which is located near the mouth of Muddy Creek. He called this area die Wachau, the German word for the Latin name Wachovia, as the area was named after the ancient Austrian estate of Count Nicolaus Ludwig Zinzendorf. Wachovia Bank received its name from the place where it was founded. Initially, the land on which Wachovia is located, was only four hundred square miles, purchased by John Carteret, 2nd Earl Granville. In the autumn of 1753, the first settlers arrived in the area, which later was called Bethabara. This city, despite its rapid growth, was not originally scheduled to be a settlement. Part of its inhabitants moved in six years later - in 1759 from the nearest village, which is called Bethania. Finally, the city Salem was founded, whose name comes from the Jewish word for peace - Shalom. The name of the new town was chosen by Count Zinzendorf. In 1766, the city began the construction of Salem, which was a typical Moravian settlement in the middle of which was a square, now called Salem Square. The city was built to house men and women who were not yet married. For years, only members of the Moravian Church had the right to live in the city. This practice was abandoned with the American Civil War. Many historic buildings in the village have been restored and are now part of Old Salem. From 1772 onwards, on the morning of Easter is held a famous worldwide Moravian sunrise service, which attracts a huge amount of believers from around the world into Winston Salem. In 1849 the town of Winston was founded, which was named after a local hero of the Revolutionary War - Joseph Winston, who was famous all over Salem. Soon after, the cities Winston and Salem entered the territory of the new Forsyth County. In 1889, the post offices in Winston and Salem were united, then both cities were formally united, in 1913. The territory of the Winston Salem has various private colleges like Wake Forest University, and Winston Salem Universities, which was opened in 1892. In Winston Salem is located the children's museum that offers kids an interesting look. The oldest historical attractions within the Winston Salem area are old Salem, Bethabara and Bethania. Among the most famous buildings in the city is the Reynolds Building - a skyscraper with twenty-one floors, built in 1929.